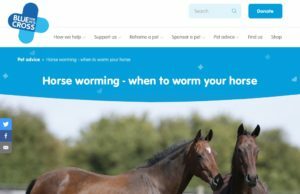 Animal charity Blue Cross have released an article encouraging horse owners to use worm counts when deciding whether to worm their horses. The article advises against routine, blanket worming which speeds up the development of wormer resistance, instead suggesting each horse is tested and only those with a high worm burden treated. Targeted treatment of worm burdens (rather than blanket worming). Preserve the effectiveness of current wormers. Reduce costs by reducing wormers used. Less chemicals for the horse to process. For more information or to book a worm count contact Agrix Nutrition here.